Water is the basic requirement for life. All living organisms need a constant supply of water to survive. Some organisms live in water, in fact 2/3 of world animals do. Many reactions in our body require water to complete. Cell shape and its internal structure depend on it. Water consists of 2-hydrogen-1-oxygen molecules. The hydrogen end has a slightly positive charge. The oxygen end has a slightly negative charge. That allows water molecules to stick to each other and many other molecules, allowing for all sorts of vital interactions in nature. Depending on the surrounding temperature, water can take different forms: ice, liquid, or vapor. At temperatures below 0'C, water molecules don't move much, so there is time to form and keep bonds between molecules. Each molecule bonds to four others in a three-dimensional structure, and water hardens into ice. As you add more heat to it, water molecules move about more. Bonds still form, but they break faster, and have less time to reform. The structures are no longer as solid, and water melts into liquid. When water temperature goes beyond 100'C, individual molecules move so fast, they break out of the pack, and escape as vapor. Water is a crucial factor preventing living cells from boiling in their own juices. Here's why. Each molecule vibrates non-stop. They vibrate more as you add more heat. But before that heat raises the temperature inside of the molecules, a lot of the heat is absorbed by breaking the bonds between the molecules. At really high temperatures, as individual water molecules escape as vapor, they carry some of the heat with them, thus taking away some of the heat from the remaining molecules inside of the cell. So water can absorb a lot of heat in oceans, seas, and inside of the body, while preventing living organisms from boiling. Cohesion is the ability to not break while under stretching. Water can be stretched by a lot. When a plant grows, and some water molecules evaporate, new water molecules are able to be pulled up to replace them, providing growth for the plant. 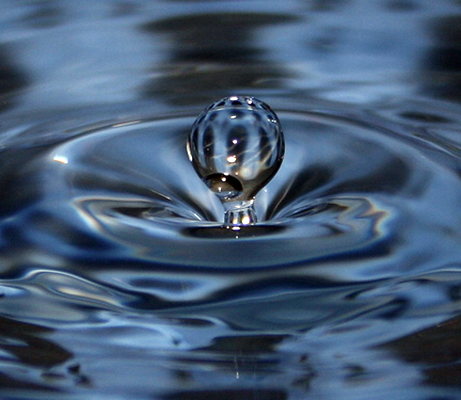 Water has the ability to dissolve other molecules. This helps to disperse the molecules of blood and other fluids of the body, into a healthy concentration for life. Starr, Cecie. Basic Concepts in Biology: From Biology: Concepts and Applications, 5th Edition. Pacific Grove, CA: Brooks/Cole-Thomson Learning, 2003. Print.